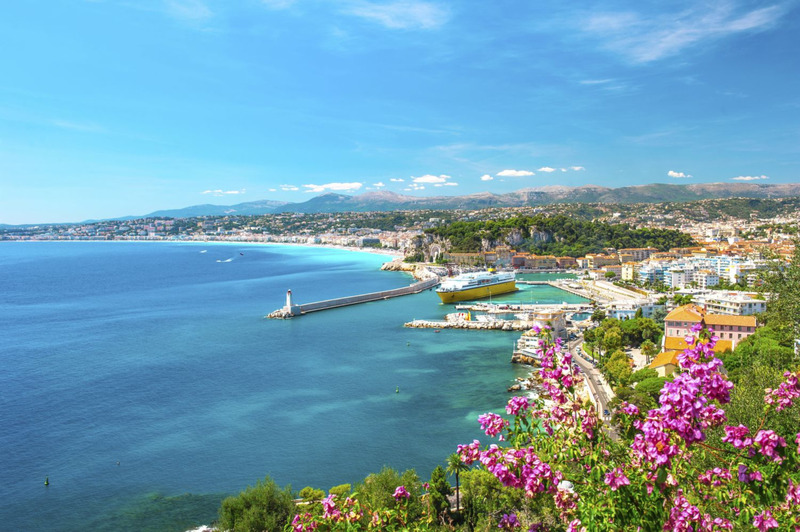 In summer the coast from St-Tropez east to Menton, also known as the French Riviera, is extremely busy, but that’s part of the fun. Most of the beaches are fabulous, and there is plenty of scope for people-watching, while lounging over a pastis on a terrace in the mostly wonderful weather. This azure-blue region has a rich artistic legacy, and the native umbrella pines sharing the landscape with acacia, eucalyptus and palm trees continue to be inspirational for modern-day artists. France’s fifth-largest city and the capital of the Côte d’Azur, Nice has been enchanting visitors since the 18th century. Graham Greene described Monaco as ‘a sunny place for shady people’, Katherine Mansfield called it ‘Real Hell’, yet there is something irresistibly absurd about this tiny mini state. At the eastern end of the Massif des Maures, St-Tropez looks north across the Golfe de St Tropez. Today this once tiny fishing village receives up to 10,000 visitors in summer, becoming a sort of Mediterranean extension of the Left Bank of Paris, with all that this implies for parking and prices. The writer Colette and other Parisians complained as early as the 1920s that “S’trop” was too crowded. Today even the yachts number in the thousands. French painters and writers had discovered it by the late 19th century and kindly recorded their findings. Paintings by these artists, some showing the unspoiled village, are in the Musée de l’Annonciade, a converted 16th-century chapel. Head for the hills to get away from holidaymakers who assemble to watch celebrities and each other. Several villages in the Maures have their own elaborate way of preparing marrons glacés, the delicious sugary chestnuts that comes foil-wrapped, and a tour could be built around them. Alternatively, since this is the place for posing, you could squeeze into discos and onto the beaches, shop in designer boutiques, admire the eclectic Hôtel Byblos, try to get a table somewhere and order a white Cassis, the best Côte white wine, or one of M. Ricard’s anisettes, and watch the mob. There are motorboat tours of the port and of Port Grimaud. From place Ile de Beauté on Nice’s Vieux Port, take boulevard Carnot (D6098), start of the Basse (Lower) Corniche. After about 5km (3 miles), turn right off the corniche into Villefranche-sur-Mer, whose natural deep-water harbour was the main port of Nice for centuries and is now a stop for cruise ships. Fork left down avenue Sadi Carnot and park on place Wilson by the 16th-century Citadelle. Overlooking the harbour is the medieval Chapelle St-Pierre, known as the Cocteau Chapel because of its frescoes painted by writer and filmmaker Jean Cocteau. Up a few steps, place Amélie Pollonnais is home to a flea market on Sundays and the pleasant brasserie Le Cosmo. Beyond the chapel, quai Courbet is lined with fish restaurants, including La Mère Germaine. Return to the D6098, then shortly after, take the D25 right towards St-Jean-Cap-Ferrat, a millionaires’ enclave. A side road turns left to the Italianate Villa Ephrussi de Rothschild with beautiful gardens, and the tiny port has some upmarket restaurants, such as La Voile d’Or. The D25 continues east into palmy Belle Epoque Beaulieu-sur-Mer, where you can visit the Villa Grecque Kérylos. Back on the Basse Corniche, another 7km (4½ miles) east of Eze-Bord-de-Mer, Cap d’Ail on the right has some Belle Epoque gems, such as the former Eden Palace hotel, where a footpath leads down to Plage Mala, a beautiful beach with the trendy Eden restaurant. Continue through Monaco, taking the Tunnel du Serrouville to Port Hercule and follow signs for Menton. At the end of boulevard d’Italie return to France on the D6098; fork left onto the D6007 and left towards Roquebrune-Cap-Martin on the D2564, the Grande Corniche. Turn off right to Roquebrune Village, clinging to the hillside in a network of alleys, and park at the foot on place Birigliano, from where steps lead up to the square for lunch in La Grotte, or smarter Les Deux Frères. At the top sits a 10th-century château, enlarged by the Grimaldis of Monaco, who ruled Roquebrune until 1860. Heading west, the Grande Corniche zigzags for 8km (5 miles) to La Turbie, where the Café de la Fontaine is a superb place to eat. Park on the square and walk through one of the medieval gateways along narrow streets to Le Trophée des Alpes, built up high in honour of Emperor Augustus. Continue westwards along the D2564, and turn left on the D45 which joins the D6007. This is the Moyenne Corniche, built in the 1920s. Park below Eze Village, a well-restored tourist village, perched on a rocky crag and accessible only on foot. Its Jardin Exotique is a feast of cacti and succulents. It’s another 10km (6 miles) along the D6007 to return to Nice. Perched villages are medieval fortified towns built on strategic hilltops to stave off invaders. A few, like Eze, are actually only a short drive from the coast, and can provide a cool break from the busy seaside resorts. Not far from the urban sprawl of Nice are two splendid examples of villages perchés, clinging to craggy outcrops above the Paillon river valley. Peille is the most remote and least-known of these two villages that date from the Middle Ages. The centre is charming with narrow streets and small squares; Place du Mont Agel has particularly fine stone houses. Leaving the square you pass the 17th-century Palais Lascaris, and a path takes you to a war memorial, where there is a magnificent view to Cap d’Antibes. Nearby Peillon, considered to be the most stunning perched village, appears as a cluster of houses clutching onto a rocky spur among olives and pines. The narrow streets, often ending in steep stone steps, wind through low-vaulted arches. The main feature is the Chapelle des Pénitents Blancs which contains lovely 15th-century frescos. A key can be obtained from the tourist office in season. Ste-Agnès and Gorbio are less charismatic, and more tourism-led, but they both have charm. Further into the hinterland are the picturesque villages of Utelle, Lantosque and Lucéram.